Cincinnati’s offensive coordinator Eddie Gran has known head coach Tommy Tuberville for roughly 25 years. The two are so close that Tuberville was the best man at Gran’s wedding. 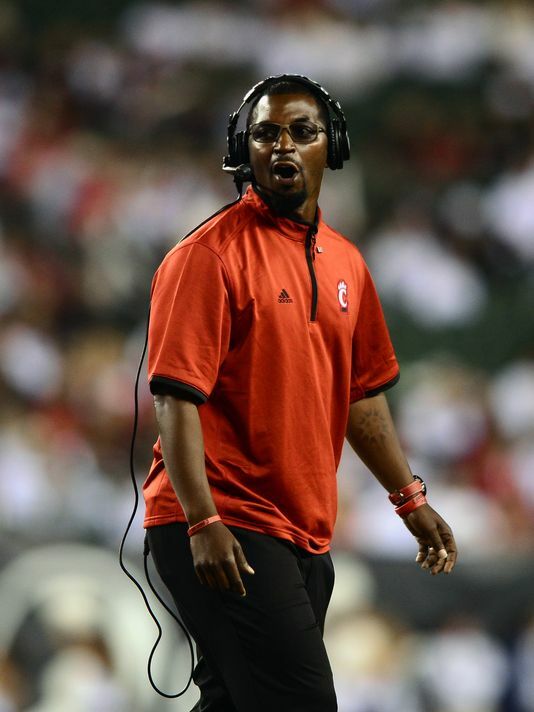 But the Bearcats new co-defensive coordinator Steve Clinkscale had no connection to the boss when he joined the UC coaching staff in 2013. Clinkscale had just finished his first year on the Illinois staff after spending three years at Toledo. Tuberville gave Gran his first opportunity to be a coordinator two years ago and now he’s doing the same thing for Clinkscale who will call the defense for the first time in his 15-year coaching career. Perhaps Tuberville’s most important piece of advice is to keep the defense simple. The 37-year-old Clinkscale is a very animated, energetic, and hands-on coach and the defense displayed more outward enthusiasm during training camp than it has in recent seasons. Clinkscale grew up as a police officer’s son in Youngstown, OH and hopes the Bearcats defense reflects his upbringing. “My father told me to, ‘Always be the hardest worker in whatever you do.’” said Clinkscale. “That’s how I’ve always been as a player, coach, and human being. His chance to prove himself as a defensive coordinator begins on Saturday night.